With Guy Ritchie now set to direct Disney's highly-anticipated Aladdin remake, the studio is shifting into casting mode. A new casting call has surfaced, which reveals that rehearsals for both the Aladdin and Jasmine roles will take place next month, and that filming is slated to begin this summer. The casting notice may also put some fans at ease, since it's clear that Disney is looking for Middle Eastern actors, with the studio making good on its promise that the cast will not be "whitewashed." Twitter user Dani Fernandez posted the casting notice, which reveals that the studio is looking for actors and actresses between the ages of 18 and 25, who "must be able to sing," with dance experience a plus. Filming is slated to begin this July, running through January 2018 in the UK, although it isn't specified which studio will be used for this live action adaptation. The fact that the casting call specifies Middle Eastern characters may be a sigh of relief for some, following the "whitewashing" controversy that swirled around The Great Wall and the upcoming Ghost in the Shell. Producer Dan Lin stated in a recent interview that the studio and director Guy Ritchie wanted to stay true to these characters. Here's what he had to say, while adding that they are looking for fresh talent to inhabit these roles, adding that these actors must have singing chops. "Listen I'm very fortunate working in Hollywood, I am diverse. So when I came in to make the movie, I wanted to make a diverse version of the movie. Luckily for me Guy Ritchie has the same vision and Disney has the same vision, so we're not here to make Prince of Persia. We want to make a movie that's authentic to that world. We're gonna be discovering new people because it's a real challenge, because not only does an actor have to act, but they really have to have singing chops. Disney's done an amazing job from Cinderella to now Beauty and the Beast. So they've really raised the bar for these musicals and these animation-to-live-action adaptations, that we have to then raise the bar on Aladdin. Disney's done such a good job between Cinderella, Beauty and the Beast, and then Aladdin will hopefully be the next one up." Guy Ritchie is directing from a script by John August with Dan Lin producing through his Lin Pictures company. While there isn't a release date in place at this time, it's possible the studio could be aiming for either a late 2018 release, or a spring 2019 release, which would fall in line with the release of several of their live-action adaptations, such as Cinderella and next week's Beauty and the Beast, which both debut in mid-March. There have been no story details released at this point, and it remains to be seen how different this live-action story will be from the original animated classic. The original Aladdin earned a whopping $217.2 million domestically during its theatrical release in 1992, with $504 million worldwide. When adjusted for inflation, that domestic tally equates to a $453.6 million movie today. We also reported back in 2015 that Disney was developing an Aladdin prequel entitled Genies, with the studio bringing aboard writers Damian Shannon and Mark Swift (Friday the 13th) to write the screenplay for the project, described as a "live-action comedy adventure." 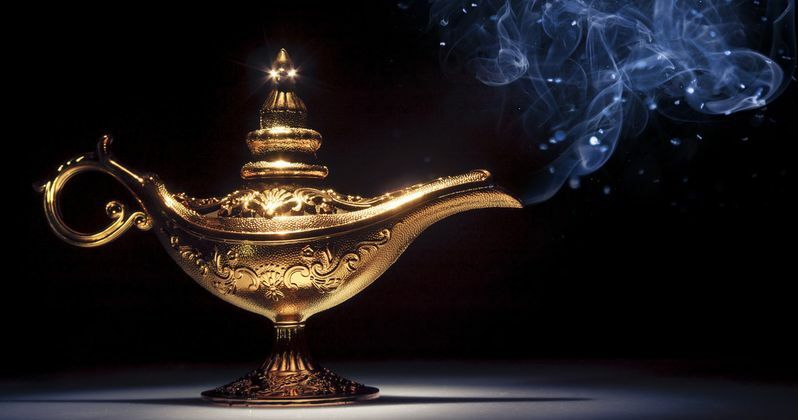 This story was said to take fans inside the realm of these magical Genies, centering on how Aladdin's particular genie becomes enslaved in this lamp. It isn't known if that project is still moving forward or not. While we wait for more on Disney's live-action Aladdin remake, take a look at the casting poster below, which includes information on how to submit an audition tape.